While I'm working on a longer blog post, I thought I'd share a few trains I saw this weekend. It was a rainy, gray weekend but I got out to railfan a bit anyway. After I visited Pete's Sparetime Hobbies near Transcona, I drove up to Day Street to see what was new at CEMR. The answer: nothing much. The two Railink units I saw back in March are still there, with hood doors open. A couple of CEMR units were shunting the yard. 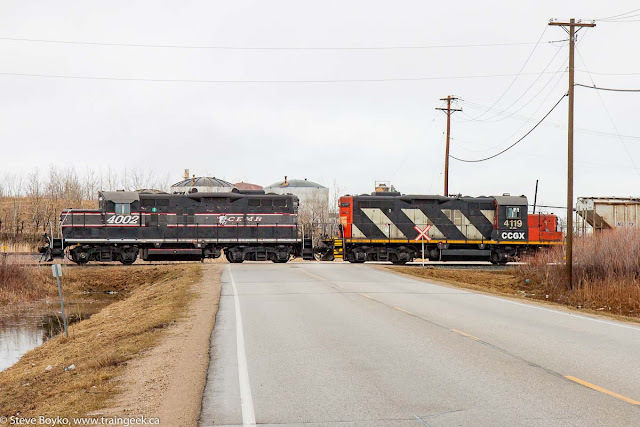 I saw headlights on the CP line to the east, so I parked a little way away from the crossing and walked back to wait for CP 8604 and CP 8722 to roll past Manson on the CP Keewatin subdivision. As I said, it was a grey weekend. 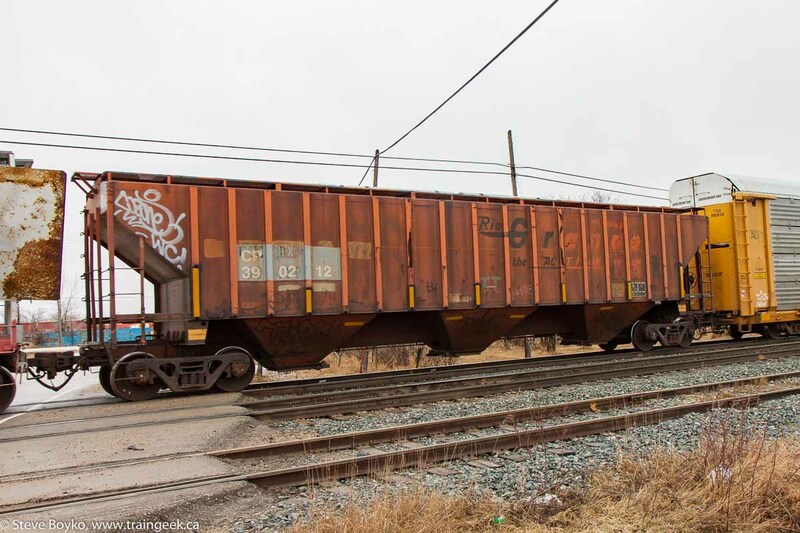 There was one interesting car in the consist, a former Rio Grande hopper that clearly was relettered a few times before becoming a CP car. I went back to CEMR to photograph the two units crossing Day Street. I think they were just shunting cars in the yard. On Sunday afternoon I went to Gooch's Hobbies and then took the long way home along the CN Rivers subdivision via Wilkes Avenue. I was outrunning a westbound CN freight led by CN 2036 and BCOL 4622. I noticed there was a train facing east so I hastened to get the meet. 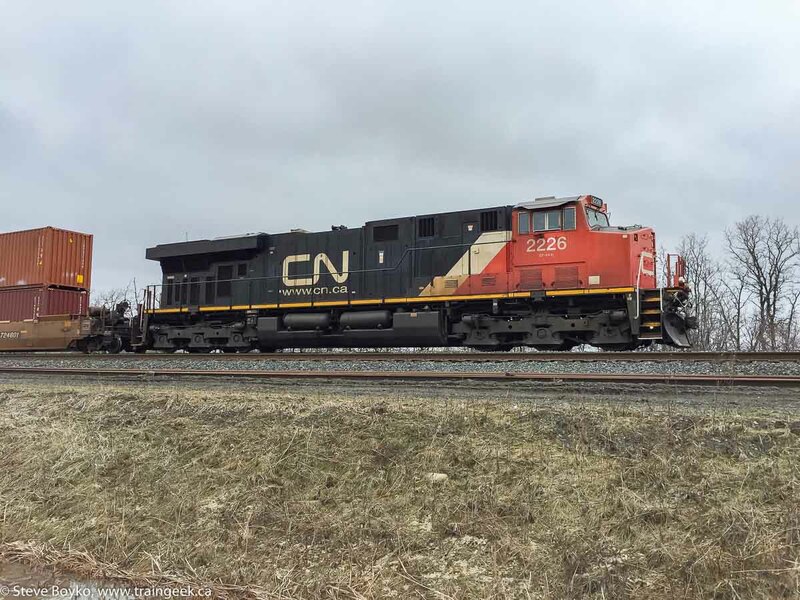 It turned out that CN 2226 East was stopped just short of Harstone Road. I don't know why they were stopped - maybe they had an unintended emergency brake application? 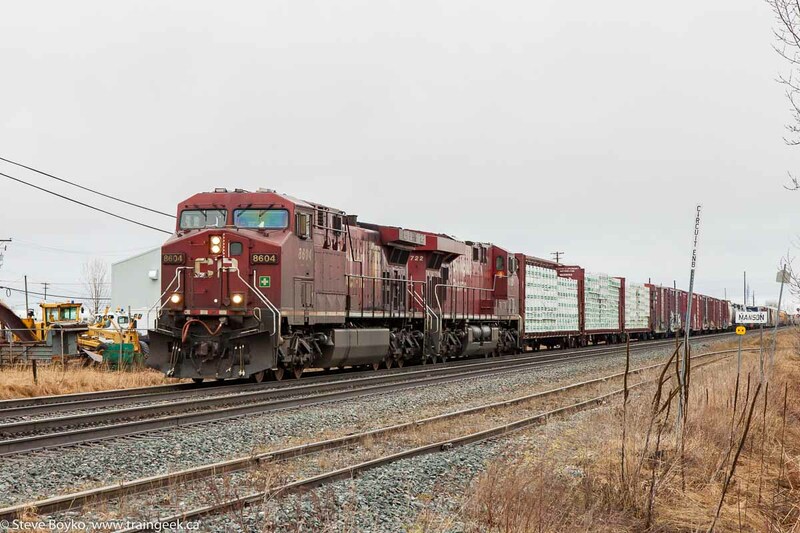 The tail end was at mile 10 so the almost 2 mile long train was blocking Harstone Road, Community Row and Charleswood Road. 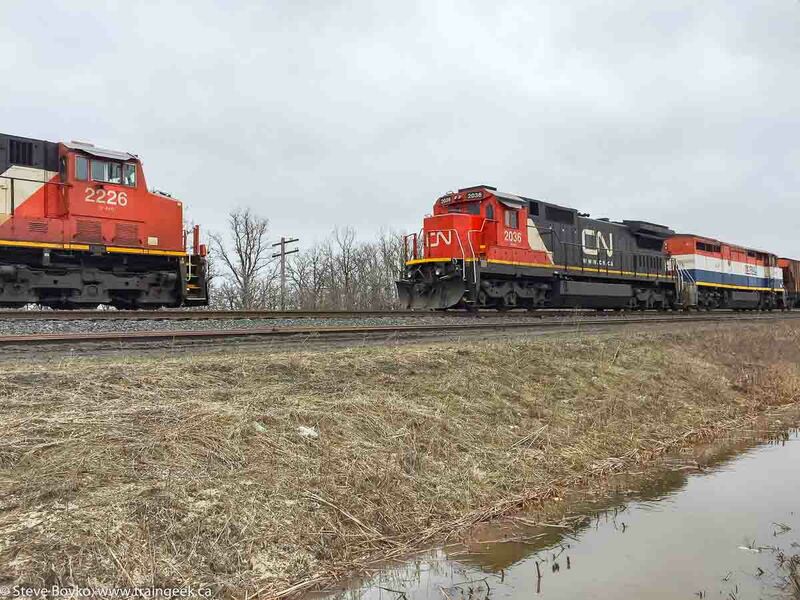 Eastbound CN trains normally stop short of Charleswood Road so they don't block any crossings. CN 2036 West came along in good time. I relocated to mile 10 to video the approaching train. While I waited, the container train started rolling away, and CN 2036 West seemed to have slowed down quite a bit while it passed the container train. Maybe they were doing an inspection as they passed. 2036 was accelerating when I recorded it. Sunday's photos were taken with my iPhone 6 as I didn't have my DSLR with me. These phone cameras do a pretty decent job! P.S. If you're wondering why I was visiting model train stores, I was taking photos of the exteriors for the model train directory I've built... plus dropping in on stores I don't visit frequently.